Each season in our house this past year has been a new experience. Winter passed by in a flurry of painting and projects, then with spring came the renovations in our kitchen and living room, not to mention the never-ending yard work. And now summer is nearly over as well, after my spending half of it with my right arm in a sling, and I can't believe it's almost fall already. As much as I love the warmth of summer, I'm excited to see the color of the trees in our backyard when the leaves change. And I'll admit, I love my boots and cozy fall outfits. The nights have been cool this week, and it feels like fall is in the air, but I know we still have plenty of hot weather ahead. Right now, the evenings are the perfect temperature for campfires, though, and we've been enjoying the fire pit on our back patio. Just the other night, we lit the torches, built a fire, and made s'mores. As commonplace as they are, there's really nothing quite so satisfying as a fire-toasted marshmallow with sweet, melty milk chocolate and crunchy graham crackers. A friend found this cute little cup and saucer for me, thinking it would be perfect in a photo shoot of something s'moresy, and she was right! 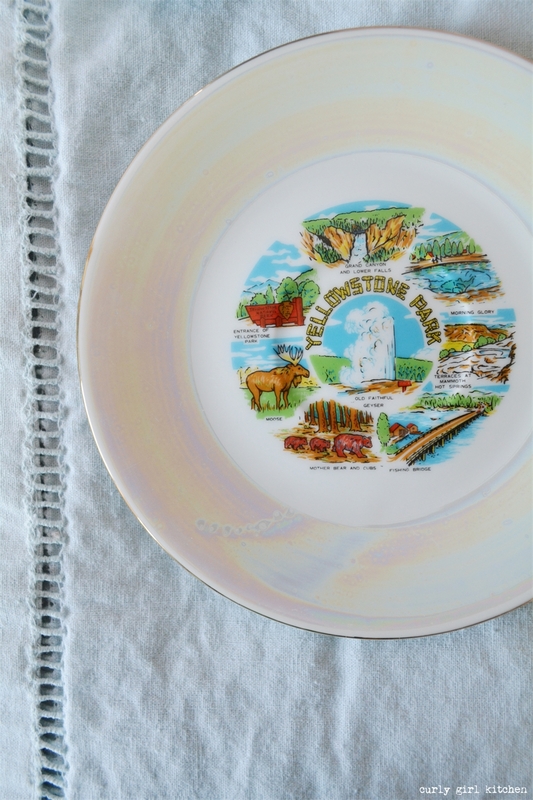 It features scenes from Yellowstone National Park - a place my family camped at when I was little - and it conjures up so many memories of exploring the woods and streams, sleeping in tents shivering under blankets on those cold nights, and making s'mores by the campfire. 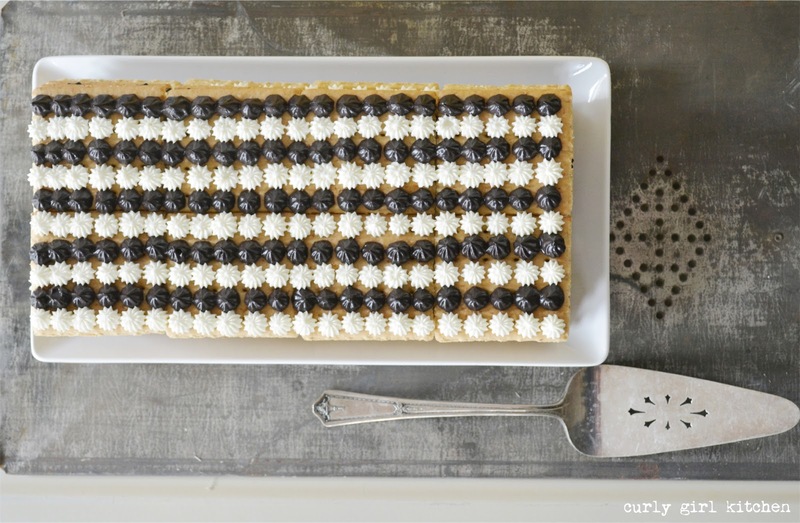 Since it's the season for s'mores, I made this beautiful icebox cake for a small dinner party with a few good friends when my brother and his girlfriend were visiting last month. 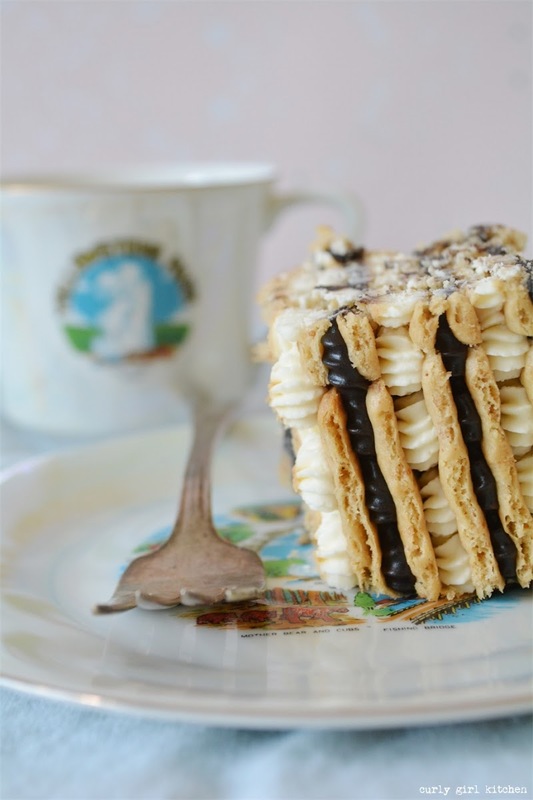 An icebox cake is a chilled dessert that usually features some sort of hard cookies that are softened with cream or pudding so that the finished layers can be sliced like cake. 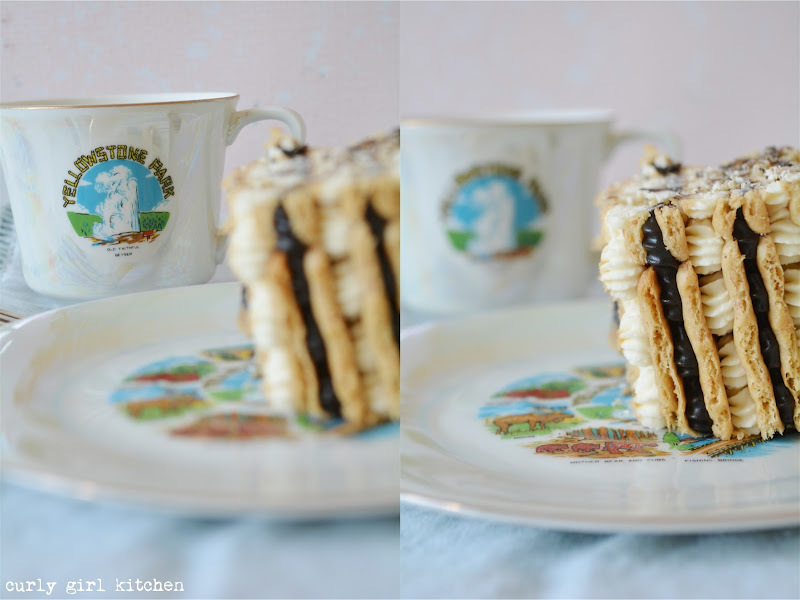 For this s'mores icebox cake, I filled graham crackers with layer after layer of whipped cream cheese and chocolate marshmallow custard. It was a lot of piping, but it looked so impressive when it was finished, I was glad I took the time to pipe each individual star. While you could pour ganache over the top of the cake as well, I loved the look of the piped stripes on top for a beautiful finishing touch. In a bowl, beat the cream cheese with the powdered sugar for several minutes until smooth. Add the whipping cream, and whip until thick and fluffy. Cover and refrigerate until needed. In a saucepan, whisk together the corn starch, cocoa powder and granulated sugar. Gradually whisk in the milk and the egg yolks. Add the marshmallows. Over medium low heat, warm the mixture until the marshmallows melt, stirring occasionally. Increase the heat to medium and cook while stirring constantly, until thickened like pudding. Remove from the heat and stir in the butter and vanilla. Cover and refrigerate until thoroughly chilled. To assemble, lay 8 single graham crackers (4 doubles) on a rectangular serving platter. Fill a piping bag fitted with a small star tip with the whipped cream cheese. Pipe a layer of cream over the graham crackers. Add another layer of crackers on top of the cream. 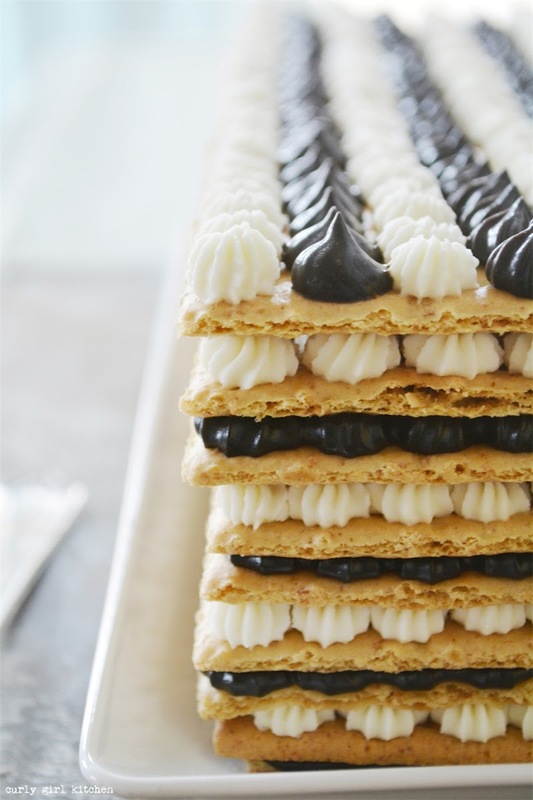 Using a separate piping bag, pipe a layer of chocolate marshmallow custard on the crackers. Repeat with additional layers, until you have 8 layers of crackers alternating with 4 layers of cream and 4 layers of custard. Pipe rows of the remaining cream and custard on the top layer of crackers. Refrigerate for about 4 hours, until the crackers soften. Keep refrigerated until ready to slice and serve.